Home / Articles / 2012 / Proposition 37: Food Transparency or Increased Organic Food Sales? Contributor David TerMolen proposes California's upcoming food transparency measure is about increasing sales of organic food products at the expense of conventional foods. On November 6, 2012, California voters will decide whether to require labeling of food products containing ingredients derived from genetically modified organisms. Proponents argue that this measure is about "food transparency" and that consumers have a right to know the source of their food, especially in light of alleged health concerns. But closer scrutiny reveals no valid basis for such labeling and that the law's primary impact would be to promote sales of organic foods at the expense of conventional, processed foods. Proposition 37, the "California Right to Know Genetically Engineered Food Act," would mandate labeling of food products that include any GMO-derived ingredients. It would also preclude "stating or implying" that food made with GMOs or "processed food" is "natural," "all natural," or "any words of similar import." 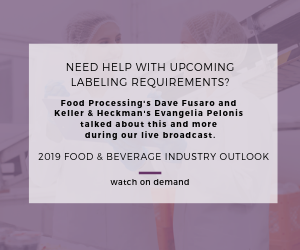 "Processed food" is broadly defined to encompass" any food produced from a raw agricultural commodity that has been subject to processing such as canning, smoking, pressing, cooking, freezing, dehydration, fermentation or milling." If passed, the law's most obvious impact would be the stigma attached to GMO-labeled foods. Mandated labels would enhance the misconceptions that exist about the safety of such foods by implying a health risk that does not exist. Indeed, the USDA, the American Medical Association, the World Health Organization, the National Academy of Sciences, and many others have all concluded that foods derived from GMO ingredients are safe and substantially equivalent to conventional alternatives. Prop 37 would thus have the ironic effect of increasing consumer confusion on the subject of GMOs. Just as significantly, food processors will be impacted by Prop 37's "mercenary" enforcement provisions and zero-tolerance for cross-contamination. The measure provides that any non-compliance is a violation of California's consumer protection and deceptive trade practices laws and allows consumers to bring private causes of action without the usual requirement to "establish any specific damage from, or prove any reliance on, the alleged violation." Plaintiff's attorneys are thus empowered to enforce the strict requirements of the act with low hurdles for maintaining such claims while imposing significant risks on food companies. Those risks would be significant for companies trying to avoid the label on conventional but non-GMO foods. From its effective date of July 1, 2014, through July 1, 2019, Prop 37would tolerate only 0.5 percent of any GMO ingredient and then a zero-tolerance policy thereafter. In contrast, a food product in Europe may contain as much as 0.9 percent GMO material and avoid a label. And in the United States, the highest-grade corn can contain as much as 2 percent foreign material, like crop residues. The measure's purity standard would be difficult to meet because the horse is out of the barn for genetic engineering in the United States. Indeed, as of 2011, 94 percent of soybeans, 90 percent of sugar beets and canola, and 88 percent of the U.S. corn crops have been genetically modified in some way. Cross-contamination is thus a huge problem. Prop 37 does include a provision to exempt foods "grown, raised or produced without the knowing and intentional use of genetically engineered seed or food" if sworn statements are provided attesting that there has not been any "knowing or intentional" use of, or co-mingling with, any GMOs. But this is simply grist for the litigation mill rather than a business-friendly safe harbor provision. Consequently, Prop 37 would increase the cost and decrease the production of non-GMO processed foods. As Steve Sexton wrote onFreakonomics.com, in an article titled "How California's GMO Labeling Law Could Limit Your Food Choices and Hurt the Poor," Prop 37's"high purity standard would likely require farmers to invest in separate planting, harvesting, storage, hauling, processing, and packaging equipment for [GMO] production in order to avoid revenue losses and liability from contaminating their non-[GMO] operations or those of competitors." Rather than incur such costs, many food companies would risk the potential stigma of labeling by including the statement "May be Partially Produced with Genetic Engineering" on all product regardless of GMO usage. Doing so, of course, would require removing all "natural" claims even if a product contains no artificial ingredients, added color or preservatives and is minimally processed. In contrast, certified organic products are except from the labeling requirements of Prop 37 regardless of any cross-contamination. There is no threshold for the amount of GMO that can be present in organic food so long as it is produced using organic methods. Accordingly, organic foods would enjoy less of a price gap with non-organic foods and face less competition from "natural" products. In sum, Prop 37is a wolf in sheep's clothing. Seemingly about "food transparency," it is actually an effort to increase sales of organic food products at the expense of conventional foods. Indeed, the measure expressly states that "Californians should have the choice to avoid purchasing foods whose production could harm the state's organic farmers and its organic foods industry." But it is the act's plain terms, rather than consumer choice, that is helping the organic foods industry.